From Richards Bay, we made a 931-mile trip to Cape Town in a week. We could have covered that distance in 3 to 4 days, but current weather patterns only allows for 2-3 days travel between weather systems. So we made the trip in 3 hops of about 300 miles each, with a 3-day layover in East London and 1 night at Plettenburg Bay. 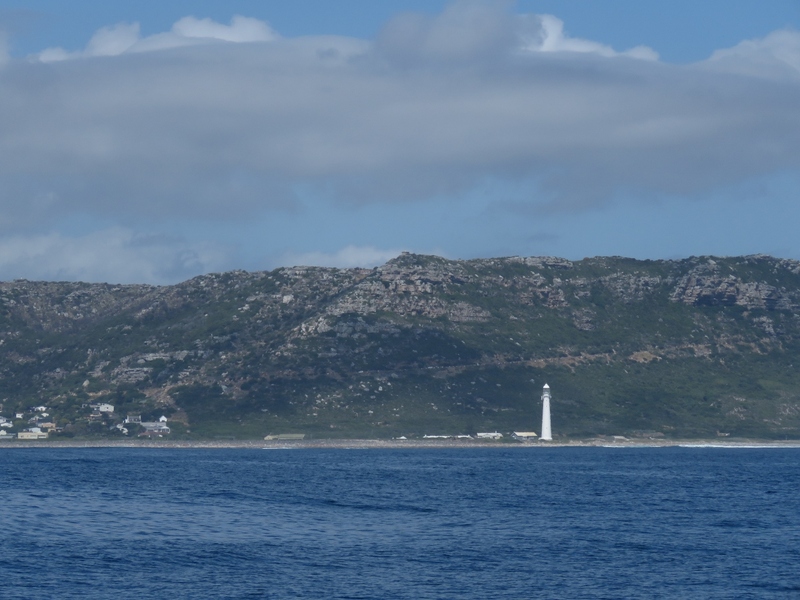 On this trip we rounded Cape Agulhas, the southernmost point on the African continent. This is our third of the five southernmost capes. It will be a long time before we are ever this far south again. 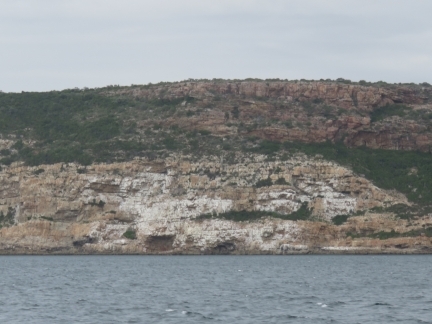 We also rounded the Cape of Good Hope, the third of the Five Great Capes that we have rounded. The others were Southwest Cape in Tasmania and Southwest Cape on Stewart Island. The distinguishing factor between the Southernmost and the Great Capes is that the Great Capes are at the southwestern point of a continent or island, where sailing vessels traveling west could finally turn northward, no longer sailing directly into opposing westerly winds. Either way, we’re three for five now. The remaining two Great Capes are Cape Leeuwin in southwestern Australia and Cape Horn in Chile. It seems unlikely that we’ll tackle either in the near future. 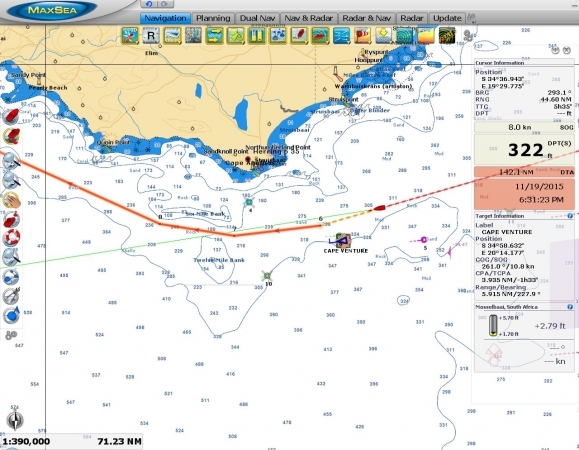 In rounding Cape Agulhas, we left the Indian Ocean and entered the Atlantic Ocean. Dirona has now cruised in all three major oceans of the world. 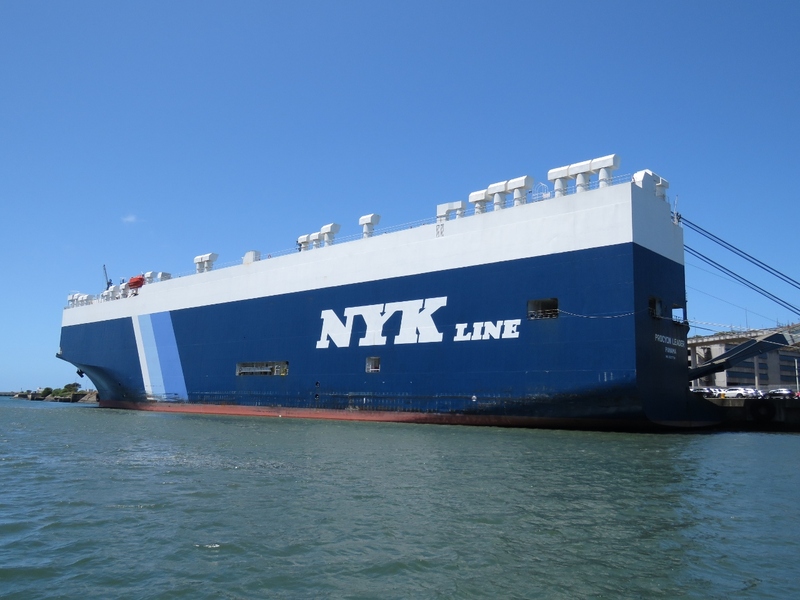 We’ve covered more than 45,000 miles since taking delivery in February, 2010 and have put 6,756 hours on our John Deere main engine, 720 hours on the Lugger wing engine, and 4,240 hours on the Northern Lights generator. All three engines have run without hiccup from day one. 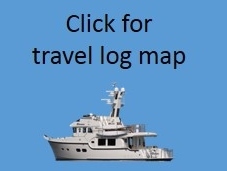 In crossing the Indian Ocean, we made our longest passage so far, and our longest stop between fuelings: 3,023 miles and 19 nights between Dampier, Australia and Rodrigues, Mauritius. The good news from running that distance is it’s pretty clear we can go even further. On this run we also got some firsthand experience with the infamous Agulhas current, both good and bad. On the good side, we often were making over 11 knots in a 9.5-kt boat. On the bad side, as we neared East London the winds picked up from moderate to SW 25-30 kts in seconds and the waves stacked up immediately against the southbound Agulhas current. 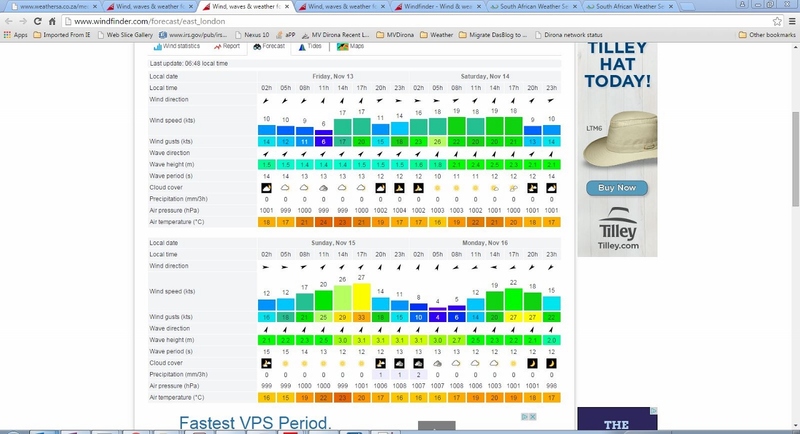 We’ve never seen seas develop so quickly and relatively moderate winds can yield positively gigantic seas. 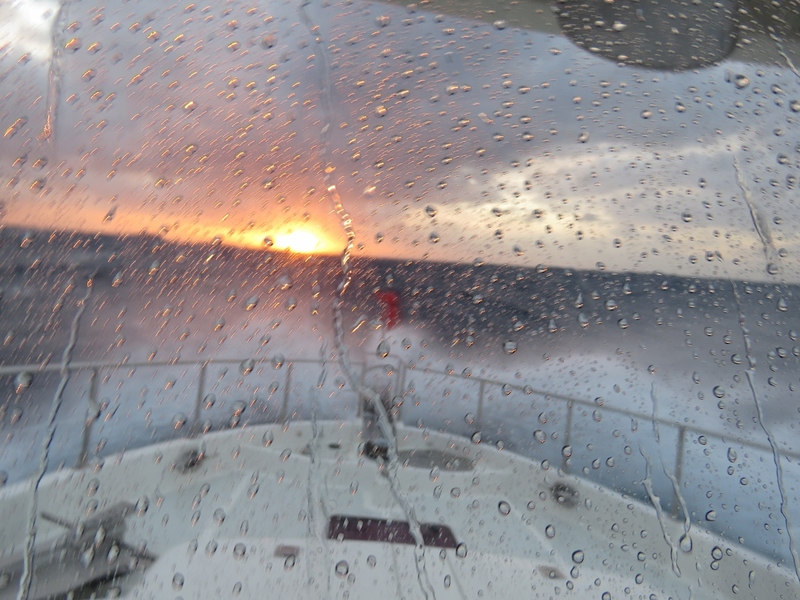 The wind was right on the nose and we took the hardest green water hit ever to the forward windows. 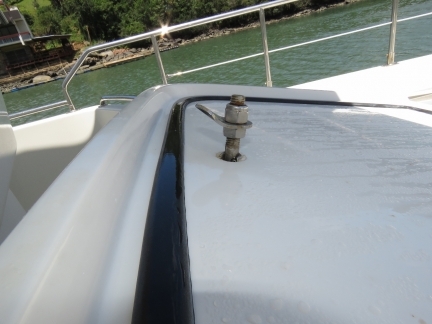 It hit so hard James ducked at the helm, and had so much force it bent the stainless steel latch that holds a forward hatch cover down and tore off the gas strut. It also bent the barrel bolt on the portugues bow door, and actually forced a small amount of water through hatch seals that never leak. It hit us like the proverbial ton of bricks. James was able to close the torn-open forward hatch from the safety of the Portuguese bridge and we reached East London, and later Cape Town, with no further issues. 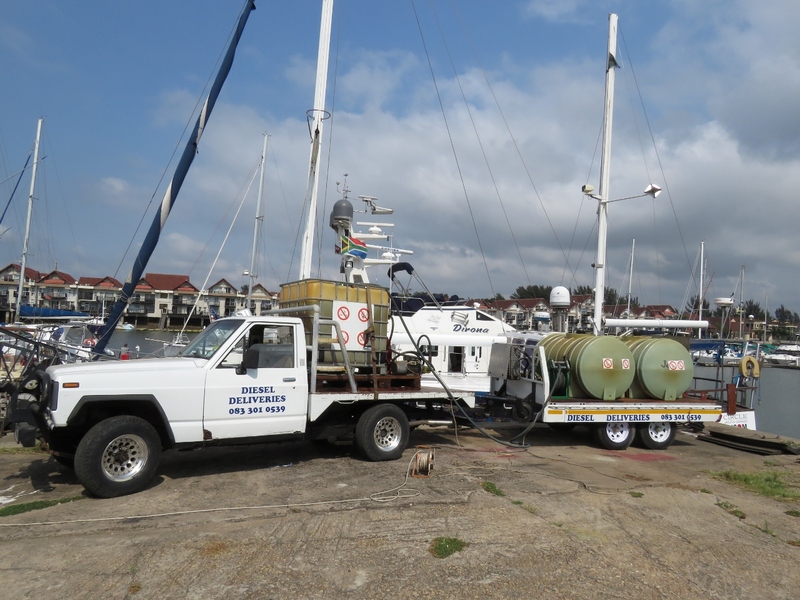 This morning we took on 1,426 gallons (5,400 L) of diesel from Pro Radio Marine at the Zululand Yacht Club. The fuel-delivery truck had a maximum capacity of 3,000L so had to make two trips. This gives you a feel for our fuel capacity: our tanks can hold 1,747 gallons (6,613 L), more than twice what you can see on the fuel truck. 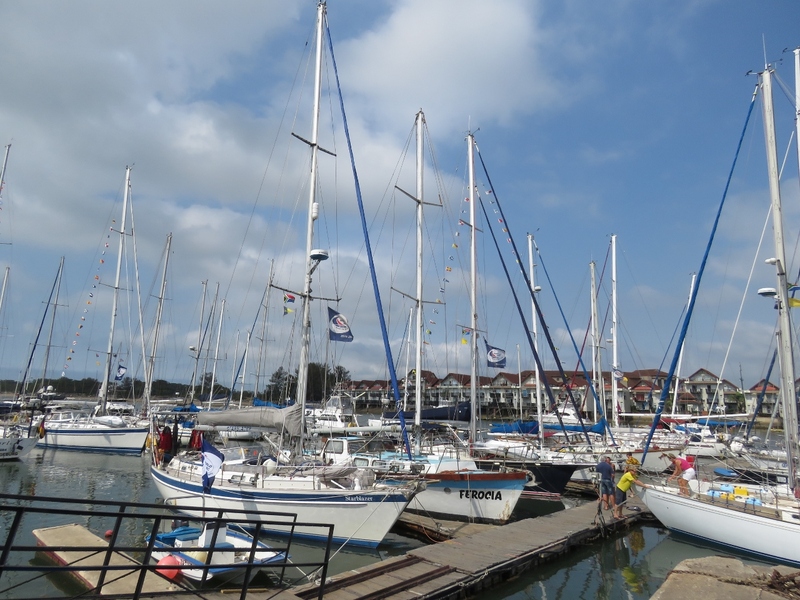 The World ARC rally boats have been arriving over the past few days. World ARC is an annual 15-month around the world rally. 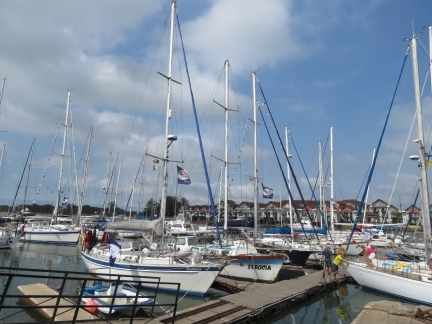 ARC tends to fill up any marina they are at and their participants often get preferential treatment for shore-side services, so most cruisers try to avoid overlapping with the rally. Generally this is not difficult, but the Indian Ocean crossing through to St. Helena in the Atlantic Ocean becomes a bit of a choke point as most cruisers aim to be in South Africa before the start of the southern hemisphere cyclone season in late November and typically will spend some portion of December in Cape Town. This is our first overlap with the full fleet. A few ARC boats had arrived early into Darwin when we were there, but the full fleet didn’t arrive until well after we’d left. 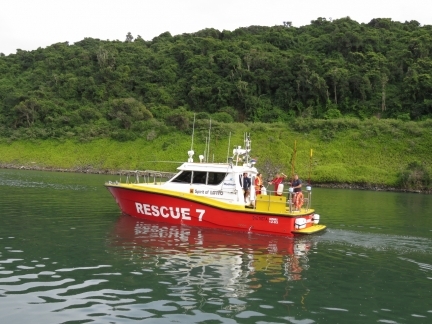 Any vessel leaving Richards Bay must file a “Flight Plan” with Port Control before being allowed to leave the harbour. 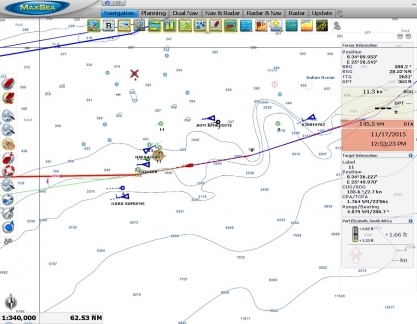 The flight plan is a multi-page document that includes a detailed description and even a drawing of the vessel (for search and rescue purposes) and information about the crew. 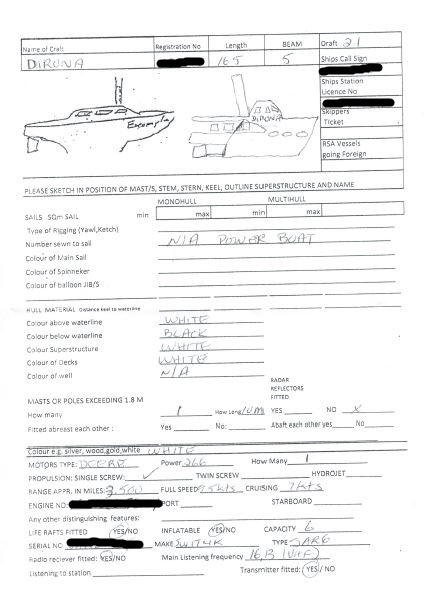 Once the flight plan is filled out, the marina stamps the plan to indicate all dues are paid, then the document must be stamped by immigration in downtown Richards Bay, and next by customs at a different location in downtown Richards Bay, and then by the Water Police at the Tuzi Gazi Marina. 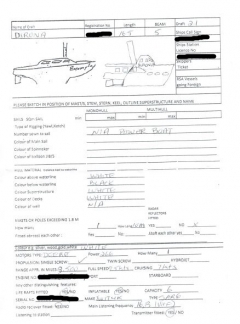 Then the document is given to the marina, who will fax it in to Port Control. If we don’t leave within 36 hours of Port Control receiving the flight plan, we have the start the process all over again. We were planning to do this all ourselves, but to save time we used a local agent who handled it all for a reasonable fee. 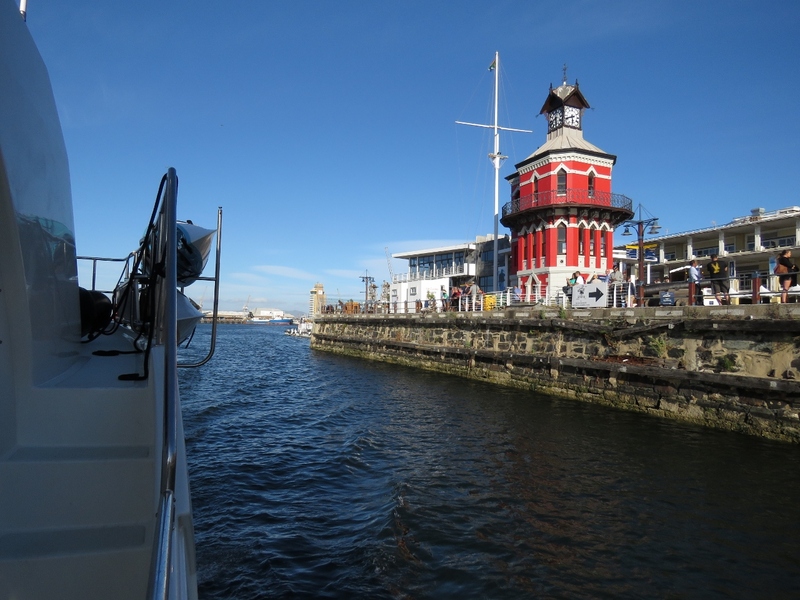 We’ve enjoyed our stay at Richards Bay, but are looking forward to getting somewhere a little cleaner. 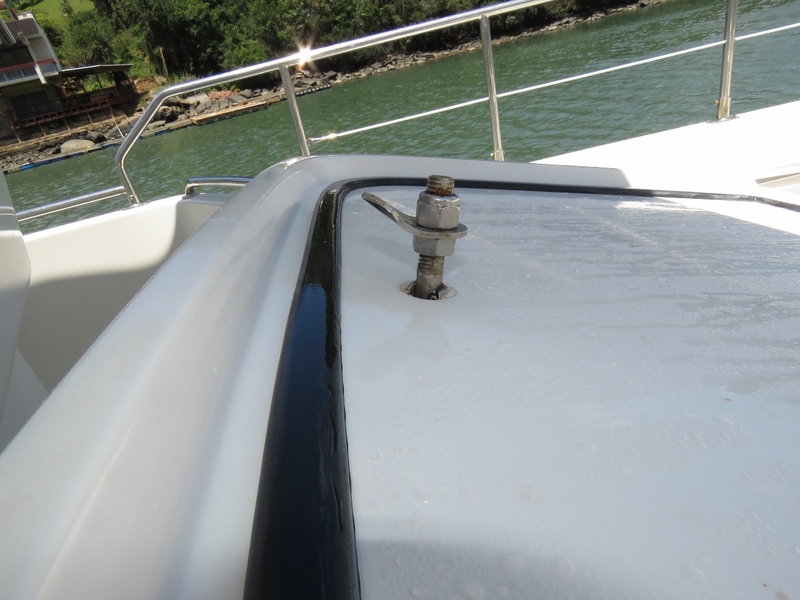 The boat is covered with windborne coal dust and brown dirt and is almost impossible to keep clean even with daily wash-downs. Water shortages make this more difficult, as we can’t hose the boat down with freshwater and have to use saltwater, which itself makes a bit of a mess. We’re just off Durban on the 900-mile run from Richards Bay to Cape Town. The current weather pattern only allows for two days between weather systems, so we’ll likely be making it in two hops with our first stop being East London. There is no shelter in the 250-miles between Durban and East London, but we should arrive just before dark and just before the wind picks up from the southwest. We had trouble finding any favourable current on the run between Richards Bay and Durban, but south of Durban we’re now getting an excellent push and are doing 11.6 knots in a 9.5-knot boat. The forecast for East London shows the winds picking up to 17-20 knots from the southwest as we approach. We’ll likely stay in East London until at least Monday while that bigger system on Sunday passes through. 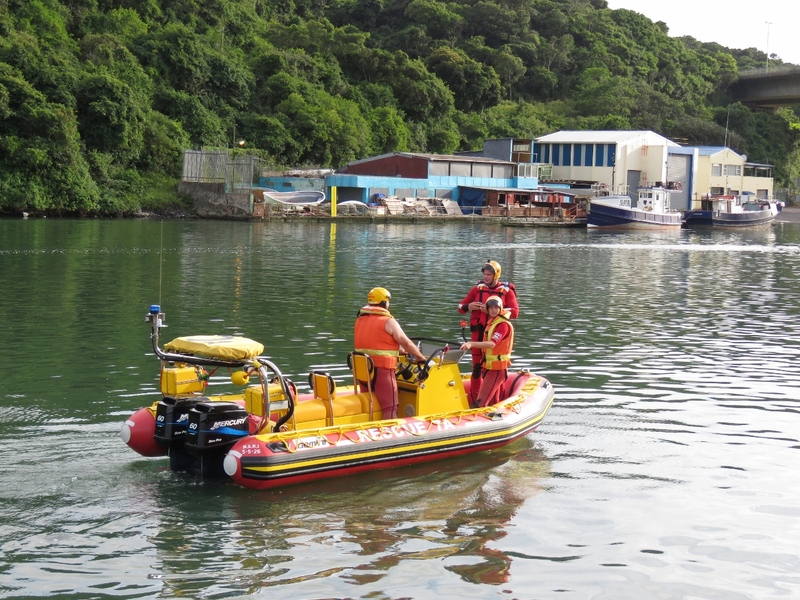 The water temperature (just above the fuel reading of 737 gallons) is an amazing 98.3 degrees in the Agulhas Current. The winds picked up as expected, but instead of 17-20 went from moderate to 25 to 30 kts in seconds. The waves stacked up imediately. 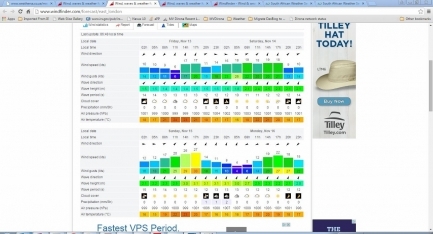 We’ve never seen seas develop so quickly and relatively moderate winds can yield positively gigantic seas. 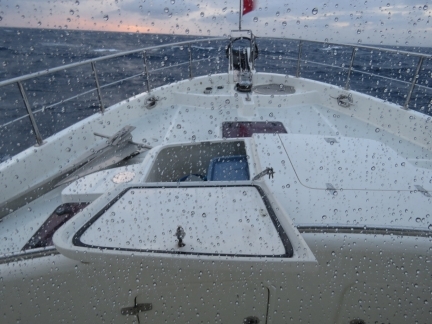 The wind is right on the nose and we just took the hardest green water hit ever to the forward windows. 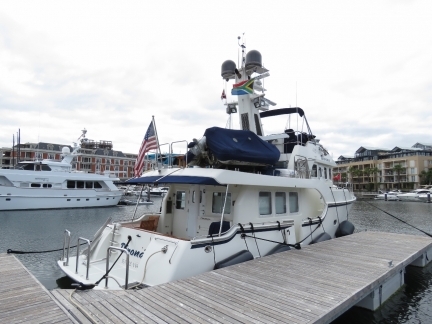 It hit so hard James ducked at the helm, and had so much force it bent the stainless steel latch that holds a forward hatch cover down and tore off the gas strut. 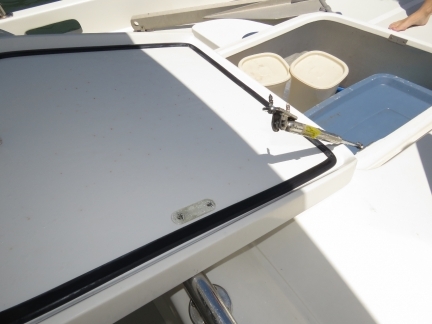 It also bent the barrel bolt on the portugues bow door, and actually forced water through hatch seals that never leak. It hit us like the proverbial ton of bricks. James was able to safely close it from inside the Portuguese bridge. We ended up getting into East London well after dark, but fortunately the harbour is relatively easy to enter at night. Buoys take up most of the allowable pleasure craft anchorage, so we anchored overnight in the swing area off the drydock. The next morning the Moyra was coming out of the drydock, so Harbor Control asked us to move. Getting him out of there will require at least the full channel. 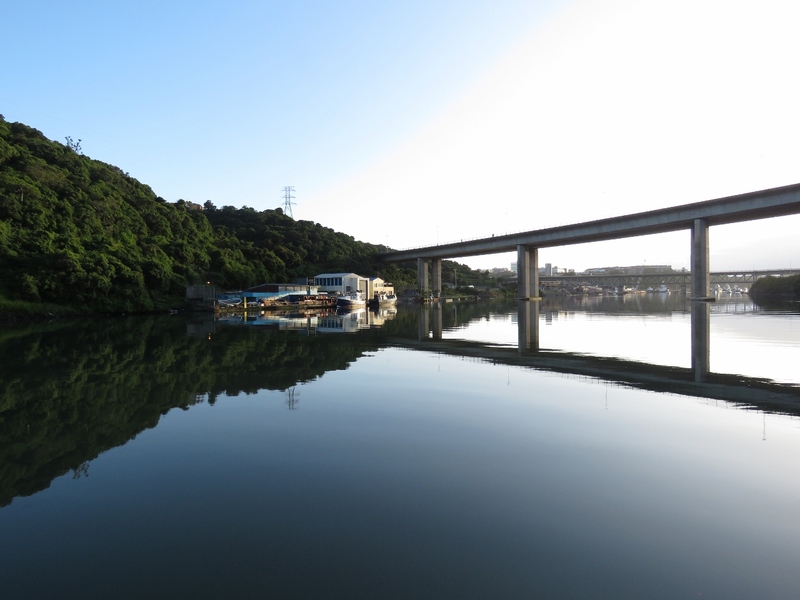 We didn’t have many options at this point for re-anchoring, and decided to see if we could squeeze under the bridge west of the pleasure craft moorings. Neither the bridge nor our charts showed the clearance, so we had to play it by eye. We have a 30ft air draft and just snuck under on an 0.8m tide with inches to spare. We’re now anchored in a pretty spot with a nice view down the river. Swing room is a little restricted but the anchor is holding well in thick mud. We’re anchored off the East London Boating Assocation. 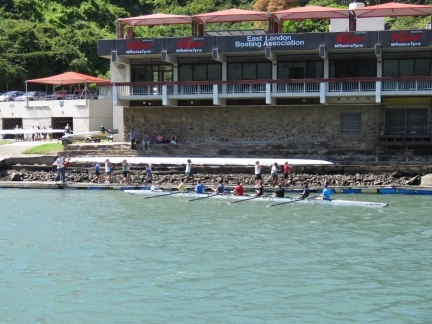 The club has a busy rowing program with multiple boats in the water much of the day. 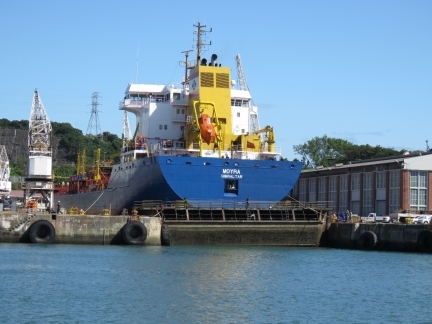 In the background of the picture, the Moyra is moving out of the drydock with tug assist. The low bridge that passed under is visible between us and the moored pleasure craft. 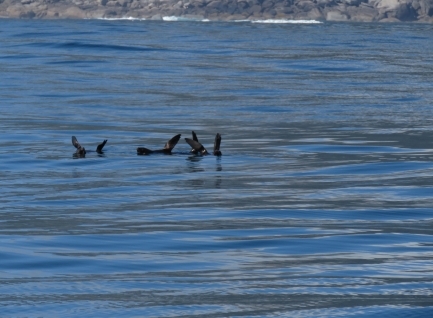 We had quite the audience as we passed under this morning. 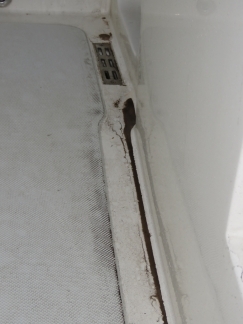 This is the latch of the forward locker that the wave tore open. The force of the water bent the stainless steel tongue. The gas strut that holds the locker door open was torn off as well. We’re lucky the entire door wasn’t carried off. Like Richards Bay, East London has a well-equipped rescue service. They came upriver to say hello. The larger of the East London rescue boats also made a pass through the anchorage to say hello. The winds howled last night, but conditions are calm now and should remain so for the next 36-48 hours. 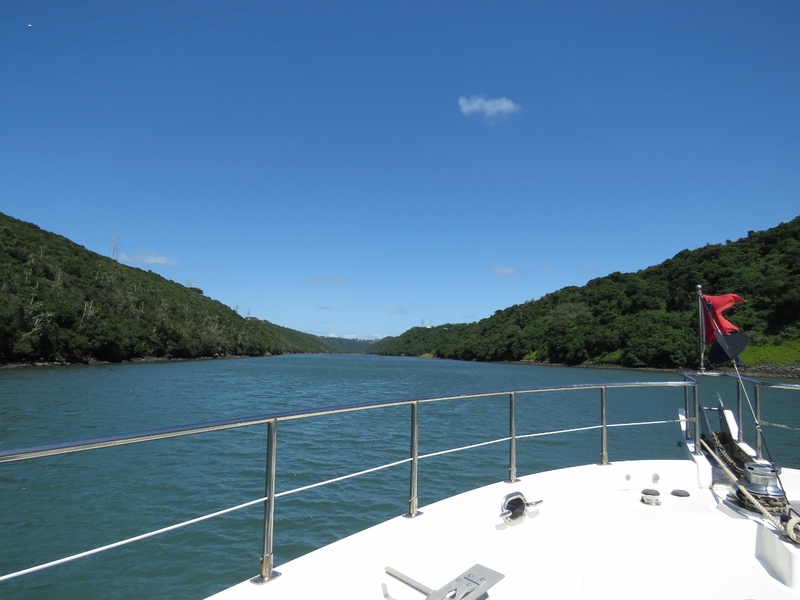 As soon as the tide falls enough for us to pass under the bridge, we’ll run to Plettenberg Bay, just east of Knysna. East London Port Control also required that we file a flight plan with them via email before they gave us permission to exit the harbour. Fortunately we could simply submit the same one we’d created at Richards Bay. The Procyon Leader had arrived to take on a load of cars from the local Mercedes car assembly plant. 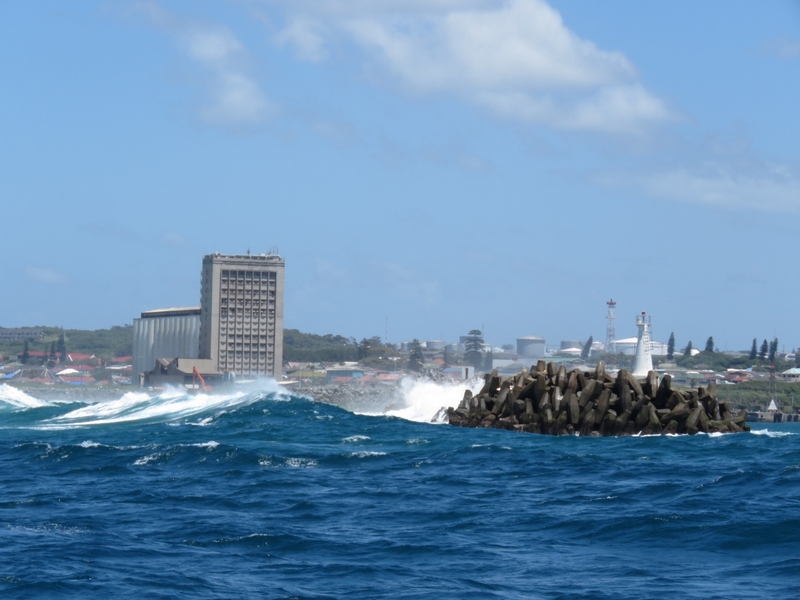 Even with fairly light the winds from the east, big swell was crashing into the East London breakwater. 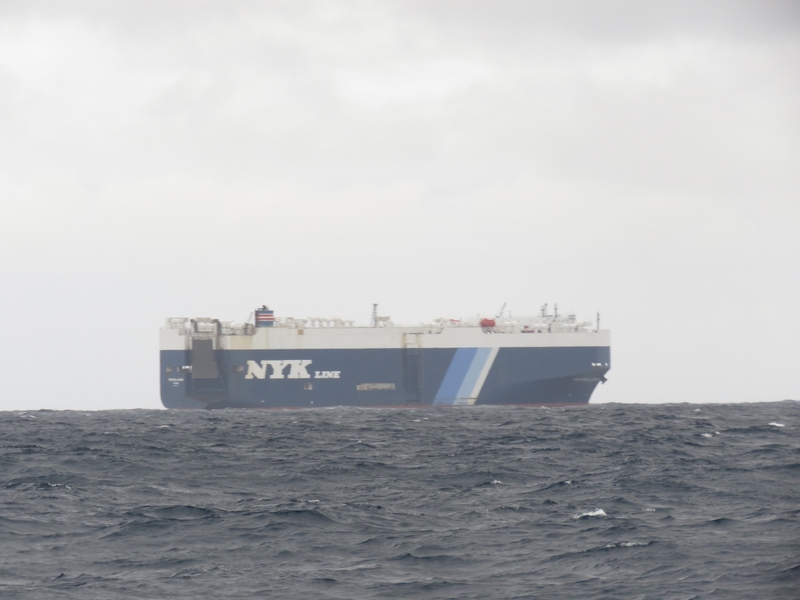 We’re back in the current and doing 11.7 knots. 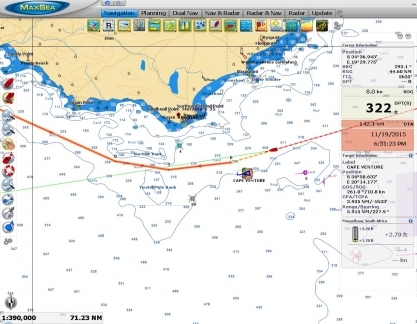 We’ll slowly pull away from it as we head to Plettenberg Bay and the current angles farther away from the coast. We passed through heavy traffic south of Port Elizabeth around midnight. 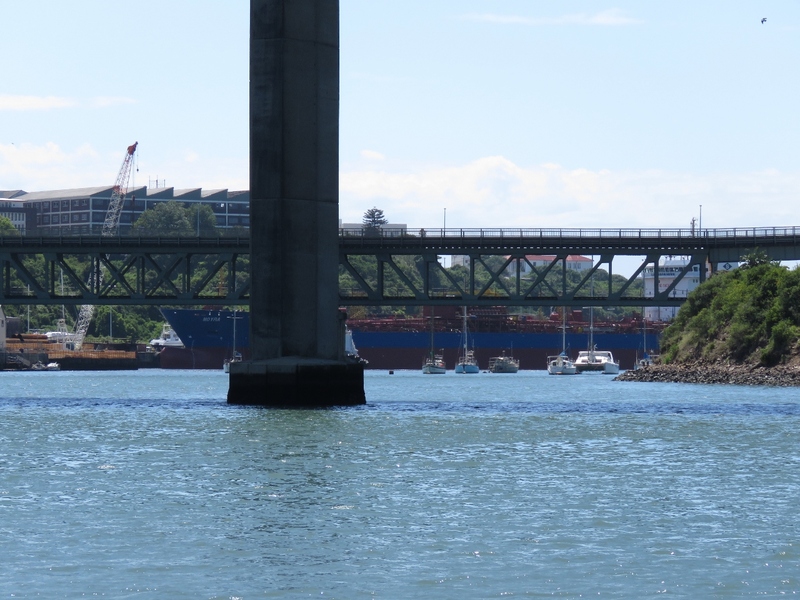 The traffic was a mix of commercial and fishing vessels. 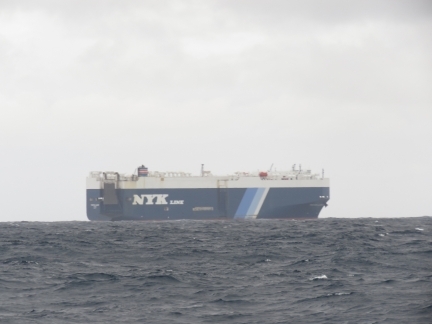 We heard several calls from fishing vessels to commercial traffic asking them to adjust course to avoid cutting the fishing lines that were trailing behind at the surface. 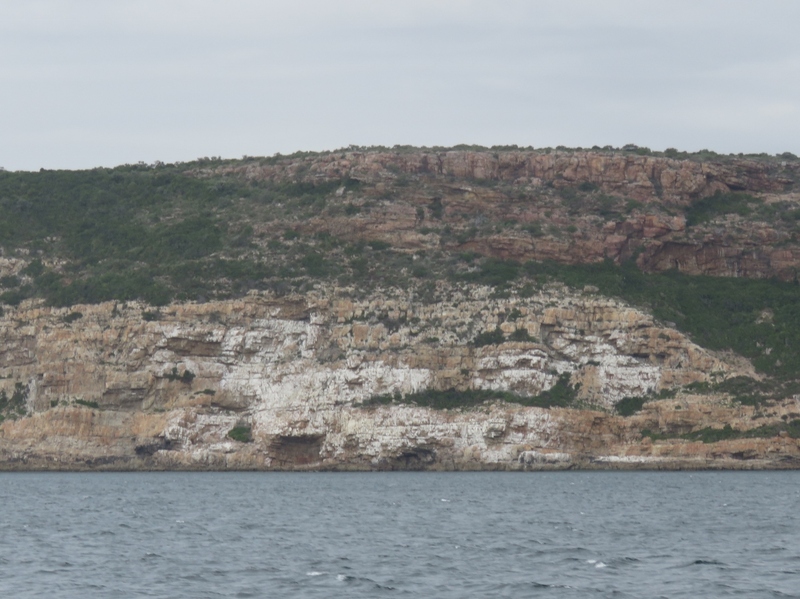 The waves had picked up as we neared Plettenberg Bay, but the cliffs south of the anchorage gave excellent wind and wave protection. We had a relaxing evening and slept well. 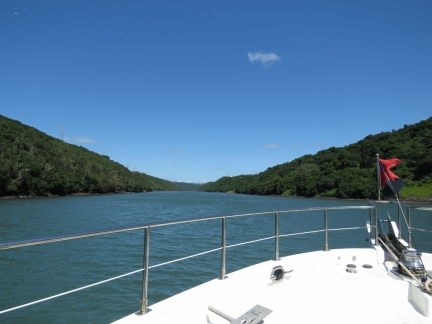 Our original plan was to go to Knysna rather than Plettenberg Bay. Plettenberg Bay is easy to enter at any time but not nearly as sheltered or beautiful as the famous Knysna. 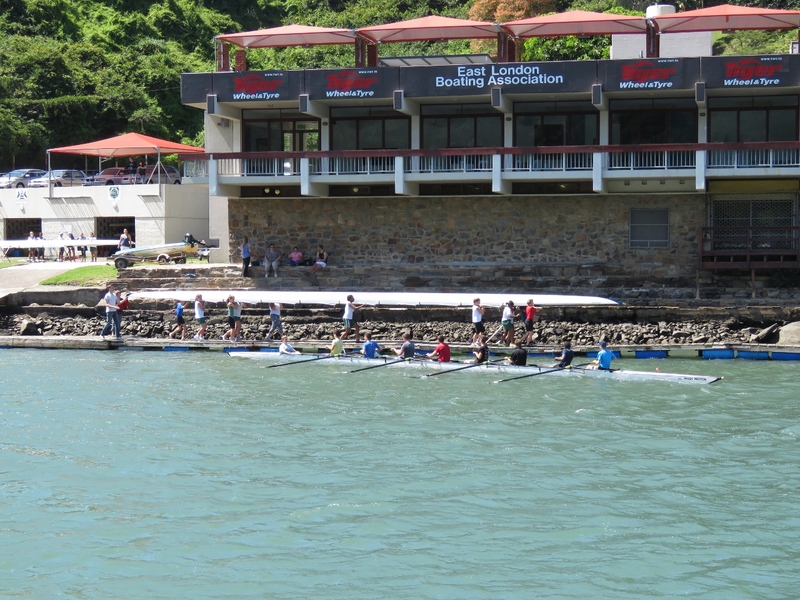 But Knysna only has 11 feet of water at the entry and is reported to be unsafe to enter at much more than a 2m swell. Conditions are nice as we pass Knysna, but the weather window is just barely enough for us to reach Cape Town, so that’s where we’re going. We’re at -34° 57.73′ S, 20&deg. 0.27’E as we round Cape Agulhas, the southernmost point on the African continent. This is our third of the five southernmost capes, the others were Southeast Cape in Tasmania and Southwest Cape on Stewart Island. It will be a long time before we are ever this far south again. Conditions have been good, with NE winds 15-20 knots and a low southwesterly swell. An unusual cloud pattern in False Bay, with the Cape of Good Hope visible on the left. (We later learned that this was smoke from a forest fire.) 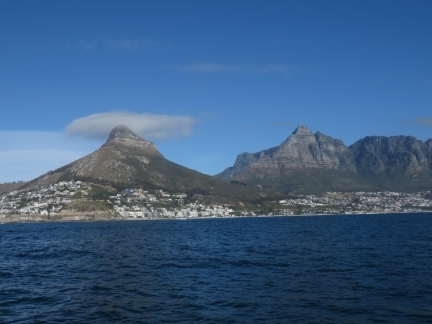 The bay was so named because sailors often mistook Cape Agulhas for the Cape of Good Hope and entered False Bay thinking they were heading into Cape Town. 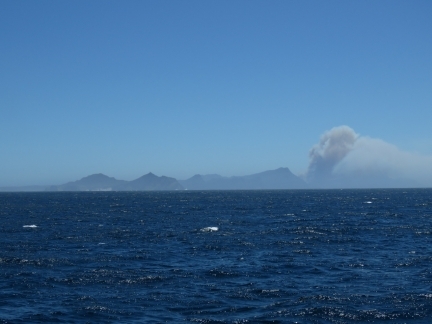 We’re making good time at 8.5 knots with help from the current and expect to reach the real Cape Town around sunset. Conditions are good with NW winds below 15, but the barometer is falling hard and we are expecting big winds later tonight or early tomorrow morning. 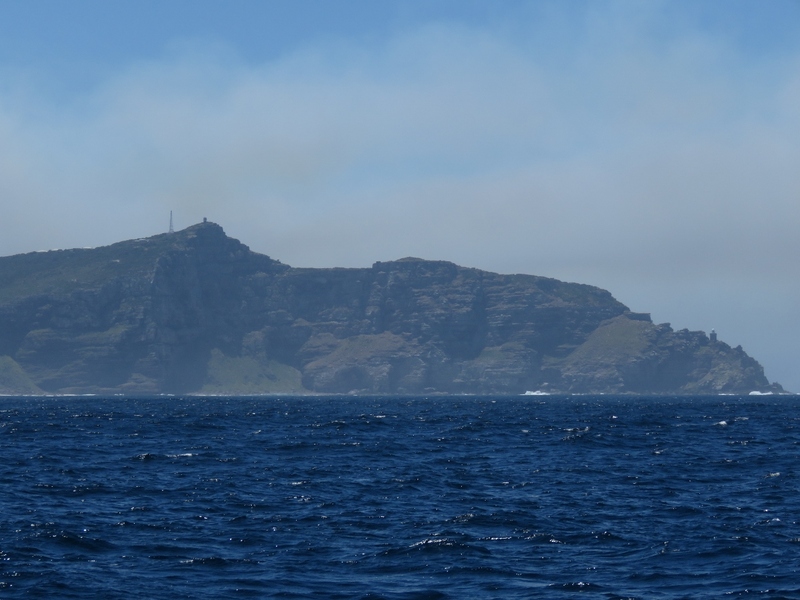 The Cape of Good Hope is the third of the Five Great Capes that we have rounded. The others were Southwest Cape in Tasmania and Southwest Cape on Stewart Island. The distinguishing factor between the Southernmost and the Great Capes is that the Great Capes are at the southwestern point of a continent or island, where sailing vessels traveling west could finally turn northward, no longer sailing directly into opposing westerly winds. Either way, we’re three for five today. 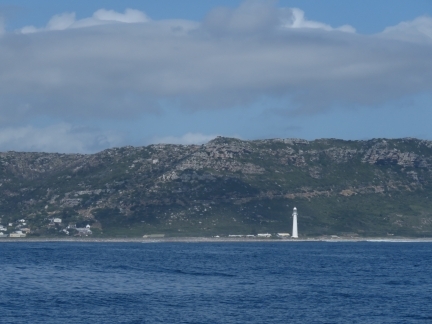 The 100-ft tall Slangkoppunt Lighthouse is the tallest cast iron tower in South Africa. The light has been in service since 1914 and is visible 33 nautical miles out to sea. 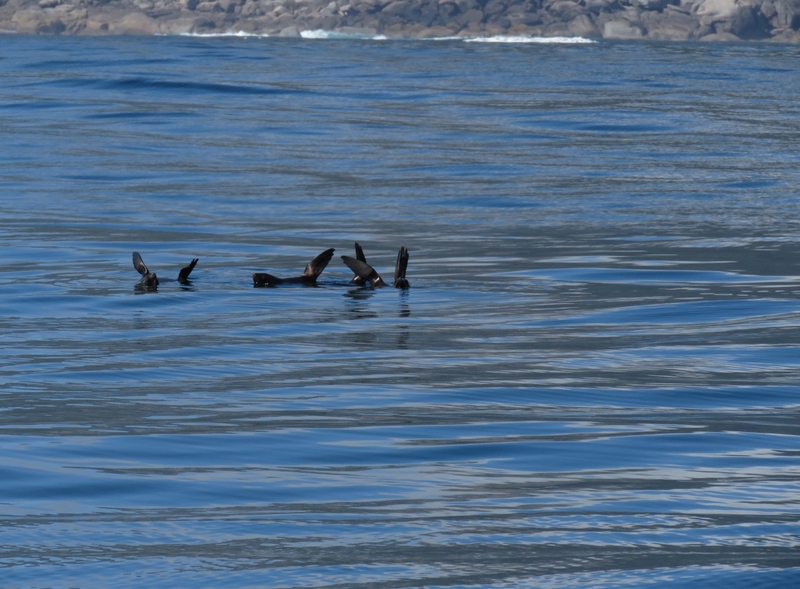 The waters here are packed with South African Fur Seals–we’ve never seen so many seals in one place. The fish must be abundant here to support such healthy colonies. Conditions are wonderfully calm as we approach Cape Town, but the BOS 400 wreck off Duiker Point is a reminder of how treacherous this coastline can be. 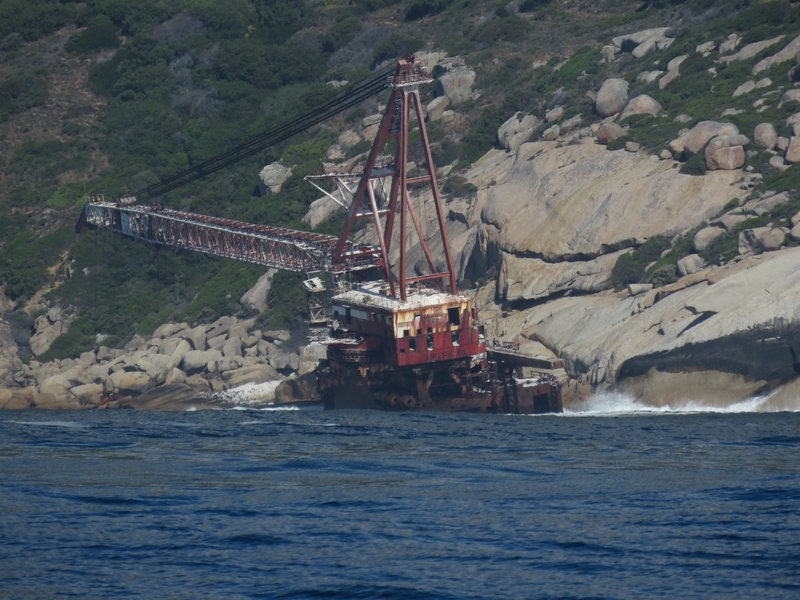 The barge was being towed from the Republic of Congo to Cape Town and went aground in 1994 when the tow rope broke during a storm. 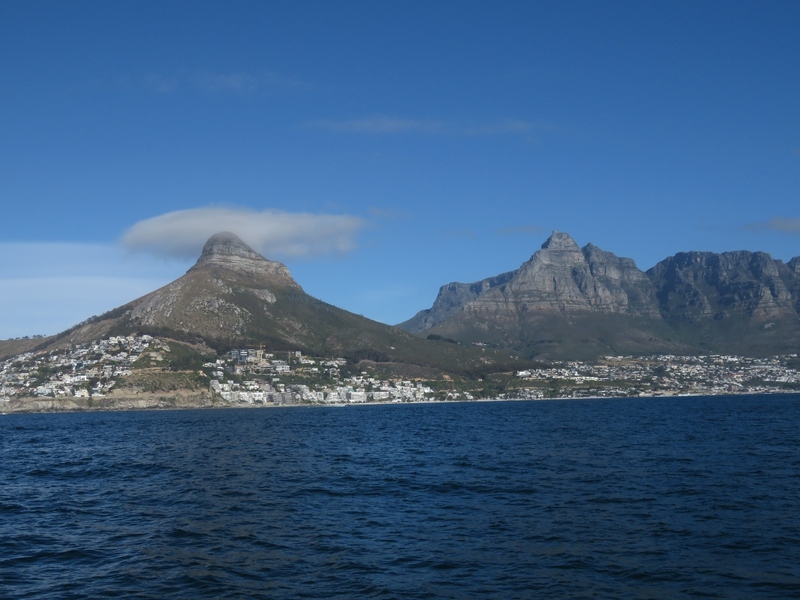 We’re lucky to be approaching Cape Town in such clear, calm weather and can run close to shore to take in the spectacular coastal scenery. 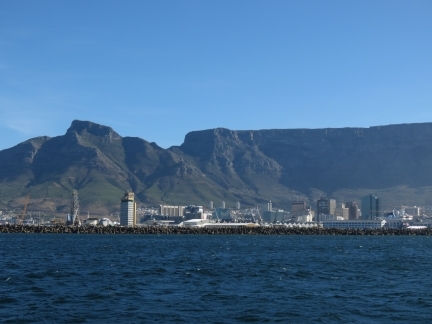 2,195 ft (669 m) Lion’s Head (left), and 3,563 ft (1,086 m) Table Mountain are iconic Cape Town landmarks. We’re almost there! 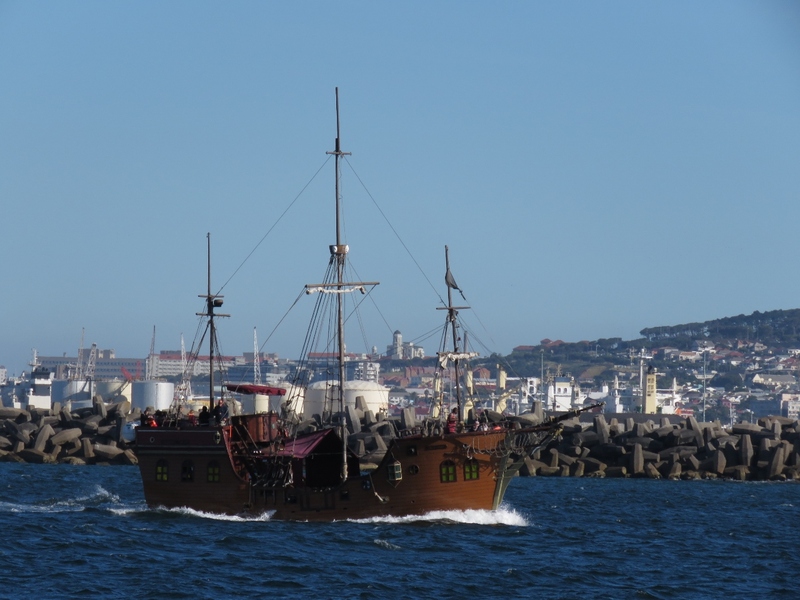 The Jolly Roger party boat was a surprisingly unseaworthy-looking vessel to be amongst the first vessel we saw as we approached Cape Town. 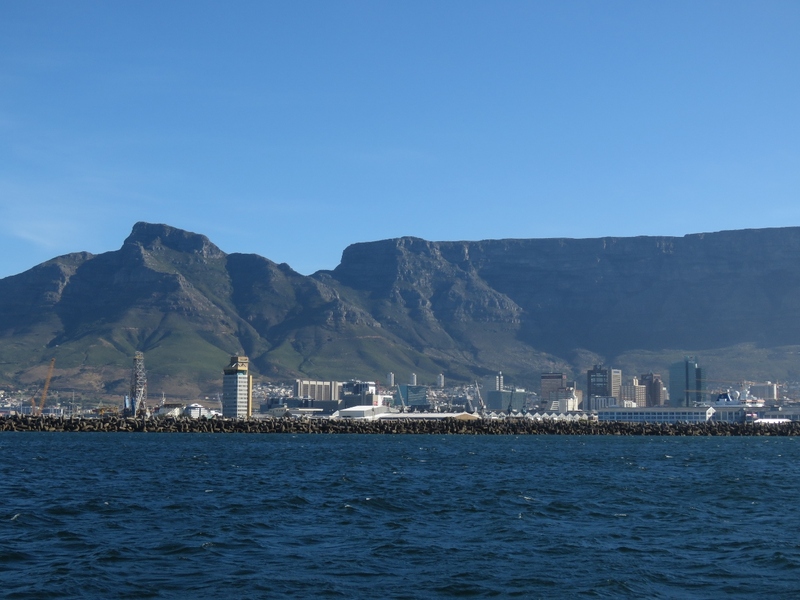 The view to Cape Town and Table Mountain from Table Bay on the approach to Cape Town Harbour. After getting permission from Cape Town Port Control to enter the harbour, we radioed to ask for two bridges to be opened so we could enter the V&A Waterfront Marina. This is looking back to the clock tower just after we’ve passed the Swing Bridge. 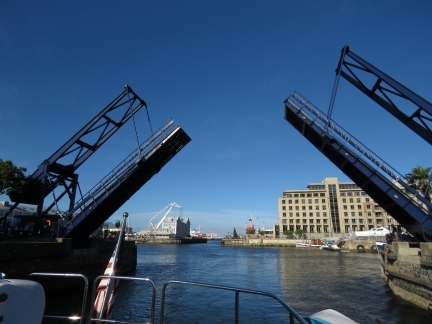 The Bascule Bridge closing behind us as we enter the marina. Moored at the V&A (Victoria and Albert) Waterfront Marina, our home for the next few weeks. Hello James and Jennifer. I have been following your adventures (almost) on a regular basis. I just read about the big wave that Dirona took on the nose which ripped the fore hatch lid. How exciting it must have been. Can you provide more description of the event? I am curious to know how big the wave was, what you felt at that moment etc. Feel free to post it on the ND mail group since I am sure some other dreamers out there would have similar interest as mine. Thank you and Happy Thanksgiving. Because the Agulhas Current runs south so hard, if the wind comes up from the south, the waves stand up. This isn’t unusual but what is surprising is the speed with which the waves stand up and the height given the wind conditions. There are many reports of 20m+ (60+ ft) in the area and some much higher. We have taken many waves over the years and I suspect that the particularily high impact of this one was a combination of the angle of the boat and the previous wave but the result was a very high impact. I suspect it’s like the cockpit. For the most part, it rarely fills but every year or two we’ll be working through conditions that aren’t really that sever, one one will slop over the top and fill the cockpit.